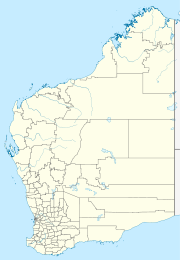 Yoting is a small town located between Quairading and Bruce Rock in the Wheatbelt region of Western Australia. Originating as a station on the Quairading to Bruce Rock railway line when it was established in 1912. Lots were surveyed in early 1914 and the townsite was gazetted later the same year. The name is Aboriginal in origin and was taken from the nearby Yoting well. The well or spring first appeared on maps in 1873. Bruce Leake, an early settler, noted that the words Yot means two women fighting with wannas or digging sticks. The surrounding areas produce wheat and other cereal crops. The town is a grain receival site for Cooperative Bulk Handling. ^ Western Australian Land Information Authority. "History of country town names – Y". Retrieved 17 April 2011. ^ "CBH receival sites" (PDF). 2011. Archived from the original (PDF) on 18 March 2012. Retrieved 17 April 2011. This page was last edited on 31 May 2018, at 05:32 (UTC).